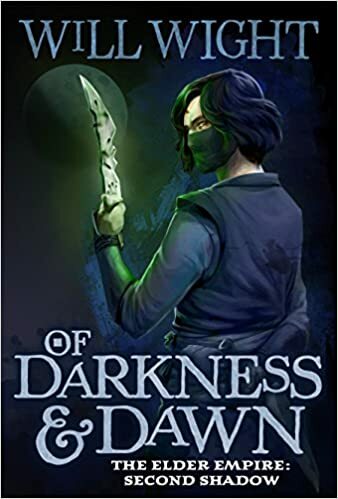 Of Darkness and Dawn is the second round of Will Wight’s experimental bifurcated story telling in the elder empire series. This is Book Two of Shadow side where we continue to follow the mean underbelly of the impressive world that Wight has built. The author reintroduces us to Shera, Lucan and Meia along with the rest of the Consultant guild. I mentioned in my review of the initial round of books that I appreciated the experiment of telling the same story from two different viewpoints. As the story goes on, I find myself liking the approach less and less. In the first installment I read both books back to back over the course of several days. While reading the first book it felt like I was always missing a piece of the story which the second book nicely wrapped up in a satisfying whole. Now a year has passed. In that time, I have read another hundred or so new books and I have forgotten a lot of the story. Now, when I tried to pick up on the story that I knew had gaps that would be filled in by the opposing viewpoint I had a really tough time getting back into the flow of plot. Anytime you pick up a subsequent story in a series you always spend a little time rebuilding the mental architecture that takes you back into that world and its characters. The new book constantly gives you hints that brings you back into that flow. However, when those hints are incomplete, as this experiment dictates, it becomes twice as hard to rebuild that mental framework. Sadly, it made this book seem very disjointed and because of that, somewhat boring. We can’t blame Wight’s writing style as there is nothing wrong there at all. It boils down to the failure of the experiment during the writing timeline. For a reader that picks these up five years from now, I doubt they will have the same problems if they can progress from one novel to the next without pause. It just doesn’t seem to work if you are trying to stay current and picking up the books as they are released. Anyway, back to the story. This books picks up where the last one left off. Shera and her crew are now on the defensive after the passing of the emperor. They, and the Consultant guild, find themselves in a battle with the factions of light. Another annoyance with this book is that we spend very little time in the present. Most of the novel takes us deep into the backstory. This is something that is always appreciated as it really fleshes out and gives life and builds empathy to the characters but it feels like the plot that takes place in the present is just not moving forward at all. If this were a marathon, the first book took us nicely past the nine mile mark. This second installment takes us just one mile further while spending almost all of its time talking about why we decided to get into running in the first place. I did appreciate that Wight was not afraid to move major characters to the headman’s block. This keeps the sense of danger that anyone can die real and meaningful. The characters become even more relatable and interesting over the course of the novel but again my primary complaint is that they just don’t accomplish enough in the present. If you were a fan of the first round of this series, it’s worth continuing but I would recommend waiting until the second novel for the light side comes out so you can read the two book together. My hope is that will bring a little more clarity to the plot.